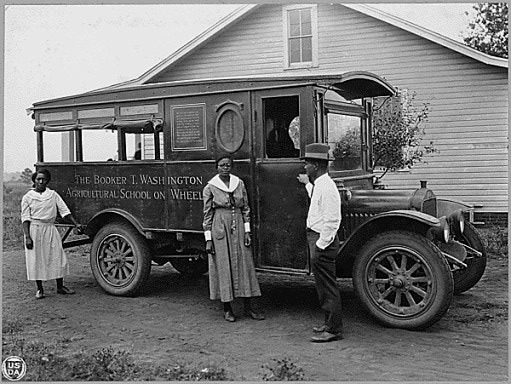 This National Archive photo of Booker T Washington’s “School on Wheels” depicts one of the early innovations of the 1890 Institutions which took education to the rural areas. February is National Black History Month, so what better lead than a feature on the 125th anniversary of the creation of the 1890 Universities, those educational institutions created to serve the country’s African-American population. Important 4-H programs were delivered from those schools before integration and continue today. National 4-H Week was created in 1945 – but in March instead of October – with the theme “Head, Heart, Hands and Health for Victory!” It’s not too early to start contacting local media to feature 4-H (and 4-H history) this fall as well as any time during the year. In 1930, Fort Worth 4-H girls featured “Secrets of Feminine Charm” in a stock show booth. Do you think they could convince women to use an apple as a skin softener, or milk as a vanishing cream? The National 4-H History Preservation Website unveils its newest informative chapter: a Compendium of 4–H Promotion and Visibility stories which delight and educate. These are vignettes from history files of the myriad ways 4-H promoted itself from local communities up to the national and international levels. It’s pleasant reading. “Voices of 4-H History” continues with Hawaii as its newest participant; the 2015 National 4-H FilmFest screens in June; University of Tennessee Collegiate 4-H joins the effort to preserve the history of campus 4-H clubs – and much more in this issue. Whether you’re snowed in, being blown around by heavy winds, slogging through driving rain or basking in the warming sun (all of which are possible in February), we hope you enjoy this issue. UGH! August in Washington, DC, is miserable. If it weren’t for our loyal readers (probably in air-conditioned offices), we’d be at the beach. Not totally true: 4-H is always “non-miserable” and there are some real success stories in this month’s Newsletter. Read on. 4-H History is best preserved at the local level and Polk County Missouri 4-H’ers grab that challenge and run with it. They’re implementing “Voices of 4-H History” the way the program was envisioned: to celebrate local alumni and highlight county history! During World War II, 40 US Liberty (cargo) ships were named by 4-H members who raised money through war bonds to commission the ships and stock them with food and supplies for our troops. Two ships were named after which Congressmen who had a significant impact on 4-H and Extension? Answer inside. Do you know if your state named a liberty ship or ships? If so, whose name did they carry. Let us know at: Info@4-HHistoryPreservation.com. All too often in history, sadly, 4-H was portrayed as only a white kid’s activity; indeed, Extension struggled long and hard to make the program relevant to all ethnic groups. Programs for Native American 4-H’ers have, in many ways, served as models to tailor programming to fit cultural realities. The 1943 Oklahoma Indian story here documents such a success. 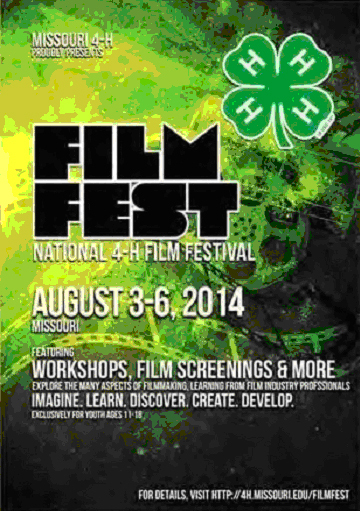 The 2014 FilmFest 4-H featured five youth developed films about 4-H History. Was your state represented this year? Read about some of the neat film-related workshops conducted this time. You’ll note two articles above written by state/local Extension staff. We want to receive more! Tell us how you use the resources we represent, and let us know your local stories. You are, after all, the history of 4-H! Contact info@4-HHistoryPreservation.com , and enjoy this issue. Five Years Old and Growing Strong! This month marks the fifth anniversary of the National 4-H History Preservation Program, and what an invigorating period it’s been! We look back at some of the program’s accomplishments during that time and marvel at the outstanding cooperation we’ve received from all organizations we’ve worked with, and the collaborative efforts of the nearly 100 volunteers whose dedication continues to inspire us. History Flashbacks: 1919 and 1938 news articles document career moves of important 4-H pioneers, O. H. Benson and A. B. Graham. Another article in the Farm Boys’ and Girls’ Leader recognized a Montana club, as the first in the state to meet national requirements for a “Standard Club.” Did you know there was such a thing? And a look to the future: since history is made every day, the future of the 4-H History Preservation Program is never-ending. What do we see ahead? What do you see ahead? “Hands on History” raises the importance of 4-H record-keeping, and “Voices of 4-H History” brings us up-to-date on various state activities, as well as plans for the 2014 National 4-H FilmFest. 2014, a year of notable anniversaries, is off to a rousing start for the History Team; we hope it’s the same for you! Happy New Year and enjoy this issue. 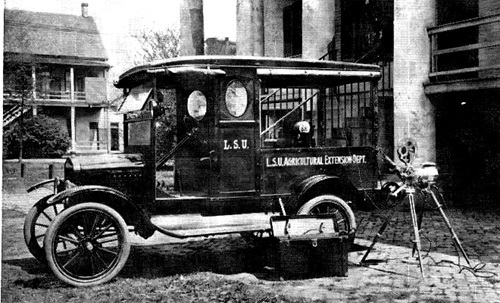 One of the first known visual aids trucks that helped extension workers take farm and home science to the youth and adults in rural areas following the passage of the Smith-Lever act and for years to come. Note that the movie projector behind the truck ran off of the car’s generator to show educational movies in the darkened school buildings. This project combined the two wonders of automobiles and moving pictures to awed youngsters and adults alike. This pioneering venture in visual education was a success from the start!